making it hard to see the light. Hard to see anything good. Hard to make it through the day. 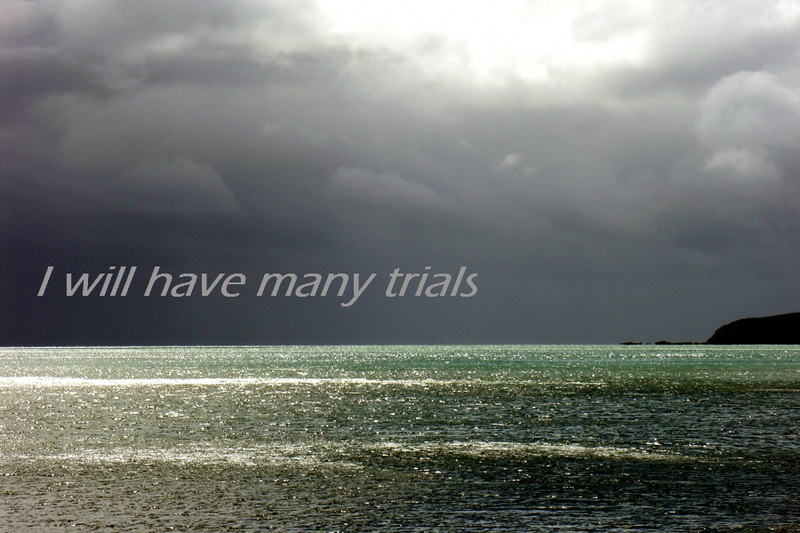 Jesus tells his disciples – and us – in John 16 that we will have many trials. Some of these trials are consequences for bad decisions we have made. And some of them happen to us because we live in a broken world which is increasingly influenced by the Prince of Darkness. Most of you know that the level of trials in my life took a big jump up this year. Yes, I will have many trials. I have a new, painful understanding of that reality. And I have a choice to make in how I respond to these trials. I can choose to get lost in self-pity and focus on what I have lost. I can get stuck on the edge of the big hole in my life and let the rest of my life be about what I no longer have. Or I can choose to let God grow my faith through these trials. I can let him become even more real in my life – a strong anchor in the storm, my faithful shepherd who lovingly leads me beside still waters and restores my soul. I am choosing to ‘take heart’ like Jesus tells us to do. I am choosing to believe that Jesus has already claimed victory over evil and this is all part of his plan. I have come to understand much more clearly now that this world of sadness and hatred and lack of respect is not my real home. And Jesus has prepared a place for me there. If you are a believer, he has prepared a place for you as well. Until then, we will have many trials. Please help grow our faith, Abba Father.